توده نفوذی لویکوگرانیتی قالقاچی به وسعت تقریبی 2 کیلومتر مربع، در باختر دریاچه ارومیه و 70 کیلومتری شمال شهر ارومیه قرار گرفته است. این توده به­صورت یک استوک کوچک در درون سنگ­های دگرگونی منسوب به پرکامبرین شامل گنایس، شیست و آمفیبولیت نفوذ کرده است. این محدوده شمالی­ترین بخش زون سنندج- سیرجان است. سن لویکوگرانیت قالقاچی برای اولین بار به­روش LA-ICP-MS دانه­های زیرکن، حدود Ma 8/3 ± 6/558 تعیین شد که فعالیت ماگمای اسیدی در پرکامبرین پایانی را نشان می­دهد و بیانگر حضور پی­سنگی مشابه پی‌سنگ پان‌آفریقای ایران مرکزی در شمال باختری­ترین بخش ایران است. حضور هسته­های قدیمی با سن بین 900 تا 2500 میلیون سال در برخی دانه­های زیرکن، بیانگر حضور سنگ منشأهای قدیمی­تر در منطقه است. این سنگ دارای مقدار = -4.3 eNd (t) با TDM= 1.61 است. این داده­ها گویای تشکیل آن از ذوب بخشی پوسته اولیه (با سن پالئوپروتروزوییک) در طول تشکیل سپر عربی در نئوپروترزوییک- کامبرین است. مقادیر 87Sr/86Sr و εNd سنگ کل و مقادیر Th/U در زیرکن­های این توده، مشارکت مواد پوسته­ای و اندکی ماگمای گوشته­ای را در ژنز این سنگ­ها در طول باز شدگی اقیانوس پالئوتتیس نشان می­دهد. The Ghalghachi leucogranite intrussion with approximately 2 Km2 is located in west Urmia Lake and 70 Km north of Urmia city. This intrussion in form of small stock has intruded into Precambrian metamorphic rocks including gneiss, schist and amphibolite. This area is part of the Sanandaj-Sirjan zone in northwestern of Iran. This is the first time that age of leucogranite was determined by LA-ICP-MS zircon grains 558.6 ± 3.8 Ma that indicates acidic magmatic activity and the presence of Pan-African basement similar to the central Iran. The presence of older cores in some of zircon grains with age between 900 to 2500 Ma suggest the presence of older rocks in the study area. The rock show negative initial eNd (t) values of -4.3 with TDM 1.61 that are consistent with partial melting of a primary crust (with Paleoprotrozoic age) that was formed during the Neoproterozoic the same as Arabian Shield. The 87Sr/86Sr and εNd of whole rock and Th/U values in zircons show the involvement of more crustal and less mantle components, during the opening of Paleotethys Ocean. اسدپور، م.، پورمعافی، س. م.، و هویس، ث.، 1392الف- ژئوشیمی، سنگ­شناسی و تعیین سن توده مافیک- الترامافیک غازان، شمال باختر ایران، مجله سنگ­شناسی، سال چهارم، شماره 14، صص. 1 تا 16. اسدپور، م.، هویس، ث.، و پورمعافی، س. م.، 1392ب- شواهدی جدید از فعالیت ماگمایی پرکامبرین و پالئوزوییک در توده قره باغ، شمال باختر ایران، فصلنامه علوم زمین، سازمان زمین­شناسی و اکتشافات معدنی کشور، سال بیست و سوم، شماره 89، صص. 129 تا 142. اسماعیلی، د.، کنعانیان، ع. و ولی­زاده، م. 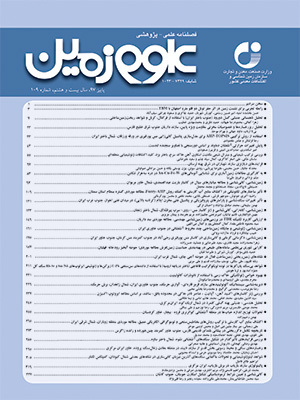 و.، 1377- جایگاه زمین­ساختی گرانیت بورنورد (تکنار) شمال- باختر کاشمر، مجموعه مقالات دومین همایش انجمن زمین­شناسی ایران. حقی­پور، ع. و آقانباتی، ع.، 1367 - شرح نقشه زمین­شناسی 250000 / 1سرو، سازمان زمین­شناسی و اکتشافات معدنی کشور. خدابنده، ع. ا. و امینی­ فضل، ا.، 1372- نقشه زمین­شناسی چهارگوش تسوج 1:100000، سازمان زمین­شناسی کشور. Ahmadi Khalaj, A., Esmaeily, D., Valizadeh, M. V. and Rahimpour-Bonab, H., 2007- Petrology and geochemistry of the granitoid complex of Boroujerd, SSz, Western Iran. Journal of Asian Earth Sciences, V. 29, p. 859-877. Alavi-Naini, M., Hajian, J., Amidi, M. and Bolourchi, M. H., 1982- Geology of Takab Saein- Qaleh. Geological Survey of Iran, Report No. 50: P. 99. Alirezaei, S. and Hassanzadeh, J., 2012- Geochemistry and zircon geochronology of the Permian A- type Hsanrobat granite, Sanandaj-Sirjan belt: A new record of the Gondwana break- up in Iran. Lithos, V. 151, p. 122-134. Asadpour, M., Heuss, S. and Pourmafi, S. M., 2014- New age data for Neotethys Ocean Opining in NW Iran by U-Pb dating of zircon. 3th International Symosium of the International Geosiences project 589, Tehran, Iran. Azizi, H., Chung, S. L., Tanakac, T. and Asahara, Y., 2011- Isotopic dating of the Khoy metamorphic complex (KMC), northwestern Iran: A significant revision of the formation age and magma source. Precambrian Research, V.185, p.85-94. Bagheri, S. and Stampfli, G. M., 2008- The Anarak, Jandaq and Posht-e-Badam metamorphic complexes in central Iran: New eological data, relationships and tectonic implications. Tectonophysics, V.451, p. 123–155. Bea, F., Mazhari, A., Montero, P., Amini, S. and Ghalamghash, J., 2011- Zircon dating, Sr and Nd isotopes, and element geochemistry of the Khalifan pluton, NW Iran: Evidence for Variscan magmatism in a supposedly Cimmerian superterrane. Journal of Asian Earth Sciences, V. 44, p. 172-179. Becker, H., Forster, H. and Soffel, H., 1973- Central Iran, a former part of Gondwanaland? Paleomagnetic evidence from Infracambrian rocks and iron ores of the Bafq area, Central Iran. Zeitschrift fuer Geophysik, V. 39, P. 953–963. Berberian, M. and King, G. C. P., 1981- Towards a paleogeography and tectonic evolution of Iran. Canadian Journal of Earth Sciences, V. 18, p. 210–265. Best, M. G. and Christiansen, E., 2001- Igneous Petrology, Oxford: Blackwell Science, p. 458. Corfu, F., Hanchar, J. M., Hoskin, P. W. and Kinny, P., 2003- Atlas of Zircon Textures. Reviews in Mineralogy and Geochemistry, V. 53, p. 469-500. Crawford, A. R., 1977- A summary of isotopic age data for Iran, Pakistan and India: Memoire Hors Serie. Societe Geologique de France, V.8, p. 251–260. Davoudzadeh, M., Lammerer, B. and Weber-Diefenbach, K., 1997- Paleogeography, stratigraphy and tectonics of the Tertiary of Iran. Neues Jahrbuch fur Geologie und Palaontologie, Abhandlungen, V. 205, p. 33-67. DePaolo, D. J., 1981- Neodymium isotopes in the Colorado Front Range and implications for crust formation and mantle evolution in the Proterozoic. Nature, V. 291, p.193-197. Eftekharnezhad, J., 2004- Explanatory text of geological map of the Mahabad quadrangle B-4, scale 1: 250,000. Geological Survey of Iran. Faure, G., 1986- Principles of isotope geology. Wiley, New York, N.Y., 2nd ed., p. 589. Faure, G., 2001- Origin of igneous rocks: the isotopic evidences. Springer-Verlag, Heidelberg, p.496. Gerdes, A. and Zeh, A., 2006 - Combined U-Pb and Hf isotope LA-(MC)-ICP-MS analyses of detrital zircons: comparison with SHRIMP and new constraints for the provenance and age of an Armorican metasediment in Central Germany. Earth Planet Sciences Letters, V.249, p. 47-61. Gerdes, A. and Zeh, A., 2009- Zircon formation versus zircon alteration – new insights from combined U–Pb and Lu–Hf in situ LA-ICP-MS analyses, and consequences for the interpretation of Archean zircon from the Central Zone of the Limpopo Belt. Chemical geology, V. 261, p. 230-243. Haghipour, A., 1981- Precambrian in central Iran: lithostratigraphy, structural history and petrology. Iranian Petroleum Institute Bulletin, V. 81, p. 1-17. Hanchar, J. M. and Miller, C. F., 1993- Zircon zonation patterns as revealed by cathodoluminescence and backscattered electron images: Implications for interpretation of complex crustal histories. Chemical Geology, V. 110, p. 1-13. Hassanzadeh, J., Stockli, D. F., Horton, B. K., Axen, G. J., Stockli, L. D., Grove, M., Schmitt, A. K. and Walker, J. D., 2008- U–Pb zircon geochronology of late Neoproterozoic–Early Cambrian granitoids in Iran: implications for paleogeography, magmatism, and exhumation history of Iranian basement. Tectonophysics, V. 451, p. 71–96. Hegner, E., Walter, H. J. and Satir, M., 1995- Pb-Sr-Nd isotopic compositions and trace element geochemistry of megacrysts and melilitites from the Tertiary Urach volcanic field: source composition of small volume melts under SW Germany. Contrib. Mineral. Petrology, V. 122, p. 322-335. Hegner, E., Klemd, R., Kröner, A., Corsini, M., Alexeiev, D. V., Iaccheri, L. M., Zack, T., Dulski, P., Xia, X. and Windley, B. F, 2010- Mineral ages and P-T conditions of Late Paleozoic high-pressure eclogite and provenance of Mélange sediments in the south Tianshan Orogen of Kyrgyzstan. American Journal of Science, V. 310, p. 916-950. Jamshidi Badr, M., Masoudi, F., Collins, A. S. and Cox, G., 2010- Dating of precambrian metasedimentry rocks and timing of their metamorphism in the Soursat metamorphic complex (NW Iran): using LA-ICP-MS, U-Pb dating of zircon and monazite. Journal of Sciences, V. 21(4), p. 311–319. Jamshidi-Badr, M., Collins, A. S., Masoudi, F., Cox, G. and Mohajjel, M. 2013- The U-Pb age geochemistry and tectonic significance of granitoids in the Soursat Complex, Northwest Iran. Turkish Journal of Earth Sciences, V. 22, p.1–31. Johnson, P. R. and Woldehaimanot, B., 2003- Development of the Arabian–Nubian Shield: perspectives on accretion and deformation in the East African orogen and the assembly of Gondwana. In: Yoshida, M., Windley, B.F., Dasgupta. S., Proterozoic East Gondwana: supercontinent assembly and breakup Special Publication. Geological Society, London, V. 206, p. 289–325. Konieczna, N., Belka, Z. and Dopieralska, J., 2015- Nd and Sr isotopic evidence for provenance of clastic material of the Upper Triassic rocks of Silesia, Poland. Annales Societatis Geologorum Poloniae, V. 85, p. 675–684. Mazhari, S. A., Amini, S., Ghalamghash, J. and Bea, F., 2010- The origin of mafic rocks in the Naqadeh ntrusive complex, Sanandaj-Sirjan Zone, NW Iran. Arabian Journal of Geosciences, V.4, p. 1207–1214. Mazhari, S. A., Bea, F., Amini, S., Ghalamghash, J., Molina, J. F., Montero, P., Scarrow, J. H. and Williams, I. S., 2009- The Eocene bimodal Piranshahr massif of the Sanandaj-Sirjan Zone, NW Iran: a marker of the end of the collision in the Zagros orogen. Journal of the Geological Society, London, V. 166, p. 53-69. Moritz, R., Ghazban, F. and Singer, B. S., 2006- Eocene gold ore formation at Muteh, Sanandaj–Sirjan tectonic zone, western Iran: a result of late stage extension and exhumation of metamorphic basement rocks within the Zagros orogen. Economic Geology, V. 101 (8), p. 1497–1524. Murphy, J., Pisarevsky, S. A. and Nance, R. D., 2013- Potential geodynamic relationships between the development of peripheral orogens along the northern margin of Gondwana and the amalgamation of West Gondwana. Mineralogy and Petrology, V. 107, p.635-650. Murphy, J., Pisarevsky, S. A., Nance, R. D. and Keppie, J. D., 2004- Neoproterozoic-early Paleozoic evolution of peri-Gondwanan ter-ranes; implications for Laurentia-Gondwana connections. International Journal of Earth Sciences, V. 93, p. 659–682. Pimentel, M. M. and Gloria Silva, M. D. A., 2003- Sm-Nd age of the Fazenda Brasileiro gabbro, Bahia, Brazil: example of robust behavior of the Sm-Nd isotopic system under extreme hydrothermal alteration. Annals of the Brazilian Academy of Sciences, V. 75(3), p. 383-392. Ramezani, J. and Tucker, R., 2003- The Saghand region, Central Iran: U-Pb geochronology, petrogenesis and implication for Gondwana tectonics. American Journal of Science, V. 303, p. 622–665. Rollinson, H. R., 1993- Using geochemical data: evaluation presentation interpretation, Longman Sceientific and Technical, p. 352. Rossetti, F., Nozaem, R., Lucci, F., Vignaroli, G., Gerdes, A., Nasrabadi, M. and Theye, T., 2015- Tectonic setting and geochronology of the Cadomian (Ediacaran-Cambrian) magmatism in central Iran, Kuh-e-Sarhangi region (NW Lut Block). Journal of Asian Earth Sciences, V. 102, p. 24–44. Rubatto, D. and Gebauer, D., 2000- Use of cathodoluminescence for U–Pb zircon dating by ion microprobe: some examples from the Western Alps. In: Pagel, M., Barbin, V., Blanc, P., Ohnenstetter, D. (Eds. ), Cathodoluminescence in geosciences. Springer, Berlin, p. 373–400. Rubatto, D., 2002- Zircon trace element geochemistry: partitioning with garnet and the link between U-Pb ages and metamorphism. Chemical Geology, V. 184, p. 123-138. Schoene, B., Dudas, F. O. L., Bowring S. A., and Wit, M. D., 2009- Sm–Nd isotopic mapping of lithospheric growth and stabilization in the eastern Kaapvaal craton. Terra Nova, V. 21, p. 219–228. Scoates, J. S. and Chamberlain, K. R., 1995- U-Pb baddeleyite and zircon ages of anorthositic rocks in the Laramie Anorthosite Complex, Wyoming. American Mineralogist, V. 80, p. 1317-1327. Shafaii Moghadam, H. S., Li, X. H., Ling, X. X., Santos, J. F., Stern, R. J., Li, Q. L. and Ghorbani, G., 2015a- Eocene Kashmar granitoids (NE Iran): Petrogenetic constraints from U-Pb zircon geochronology and isotope geochemistry. Lithos, V. 216-217, p. 118–135. Shafaii Moghadam, H. S., Li, X. H., Stern, R. J., Ghorbani, G. and Bakhshizad, F., 2016- Zircon U–Pb ages and Hf–O isotopic composition of migmatites from the Zanjan–Takab complex, NW Iran: Constraints on partial melting of metasediments. Lithos, V. 240-243, p. 34–48. Shafaii Moghadam, H., Li, X. H., Ling X. X., Stern, R. J., Santos, J. F., Mienhold, G., Ghorbani, Gh. and Shahabi, Sh., 2015b- Petrogenesis and tectonic implications of late Carboniferous A-type granites and gabbronorites in NW Iran: Geochronological and geochemical constraints. Journal of Lithos, V. 212, p. 266-279. Stampfli, G. M. and Kozur, H., 2007- Europe from the Variscan to the Alpine cycles. In: Gee, D.G., Stephenson, R. (Eds. ), European Lithosphere Dynamics. Memoir of the Geological Society (London), p. 57–82. Stern, R. J., 2008- Neoproterozoic crustal growth: The solid Earth system during a critical episode of Earth history. Gondwana Research, V. 14, p.33-50. Thiele, O., Alavi, M., Assefi, R., Hushmandzadeh, A., Seyed-Emami, K. and Zahedi, M., 1968- Explanatory text of the Golpaygan quadrangle map. Quadrangle E7. Geological Survey of Iran, Tehran, Iran. Ustaomer, P. A., Ustaomer, T., Gerdes, A. and Zulauf, G., 2011- Detrital zircon ages froma Lower Ordovician quartzite of the A degrees stanbul exotic terrane (NW Turkey): Evidence for Amazonian affinity. International Journal of Earth Sciences, V. 100, p. 23–41. Veevers, J. J., 2003- Pan-African is Pan-Gondwanaland: Oblique convergence drives rotation during 650-500 Ma assembly. Geology, V. 31, p.501-504. Williams, I. S. and Claesson, S., 1987- Isotopic evidence for the Precambrian provenance and Caledonian metamorphism of high grade paragneisses from the Seve nappes, Scandinavian Caledonides. II: Ion microprobe zircon U-Th-Pb. Contribution to Mineralogy and Petrology, V. 97, p. 205-217. Yajam, S., Montero, P., Scarrow, J. H., Ghalamghash, J., Razavi, S. M. H. and Bea, F., 2015- The spatial and compositional evolution of the Late Jurassic Ghorveh-Dehgolan plutons of the Zagros Orogen, Iran: SHRIMP zircon U-Pb and Sr and Nd isotope evidence. Geologica Acta, V. 13, p. 25-43.